The sock bun is one of those hairstyles that never fail, kind of my favorite hair safety net. It works for literally any occasion and on any hair type, specially practical for a bad hair day. 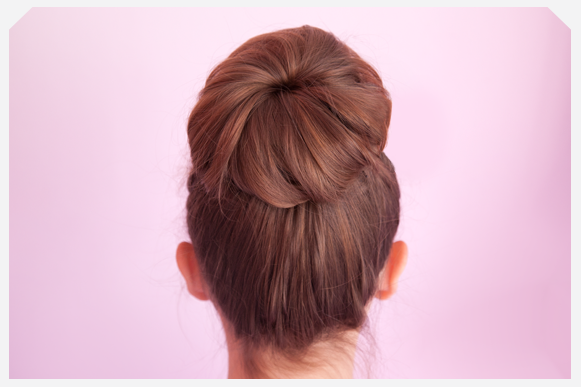 However, unlike the regular bun, this hairstyle involves a trick, and whoever invented it is a true genius. Putting a sock in your bun? Well, yes. The sock is what gives the bun that neat, perfect look. And because I have no intention of killing this current obsession, here's a simple tutorial on how to get the look. - Cut the toe off of the sock to create a tube. - Roll your tube into a ‘bagel’ shape. - Make a ponytail in your hair where you want the bun to rest. - Pull your ponytail through the center of the sock bagel and spread your hair around the sock. - Roll the sock down the length of your ponytail (towards your head) and wrap your hair around it as you go. - When you’ve reached the base of your ponytail, tuck in any remaining ends and make sure the sock is covered with hair. I also recommend the sock bun with wet hair when going to bed, to wake up with soft , loose waves. So, are you trying this hairstyle any time soon?